The Alice membership will be voting on whether to endorse Alex Randolph for San Francisco City College Board of Trustees. This past May, the PAC recommended an early endorsement, and the membership agreed last month to hold a vote on the early endorsement. Voting will run from 6:30-7:15 at the San Francisco LGBT Center, 1800 Market St, San Francisco. 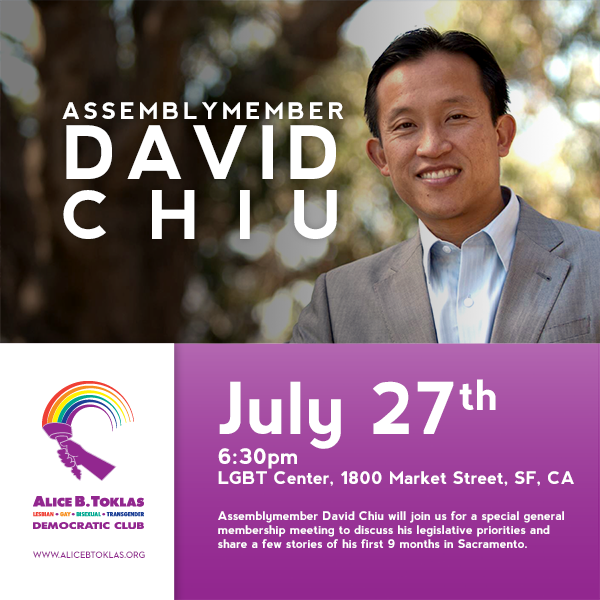 Assemblymember David Chiu will join us for a special general membership meeting to discuss his legislative priorities and share a few stories of his first nine months in Sacramento. This meeting will run from 6:30-7:30 at the San Francisco LGBT Center, 1800 Market St, San Francisco. 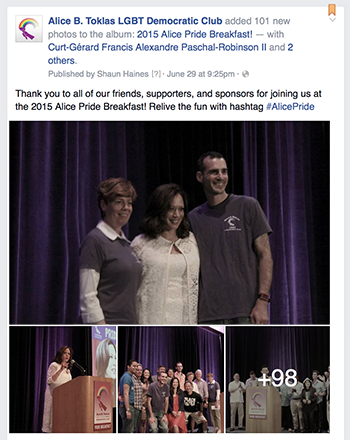 Thank you to all of our guests, supporters and friends for attending our 2015 Alice Pride Breakfast on June 28th.